What "stuff" can you buy? You can buy everyday items--chairs, desks, furniture, computers, and electronic equipment--that can go in your home or office. You can also buy hand tools, watches, and jewelry, as well as vehicles, including cars, trucks, boats, and even airplanes! If you're interested in buying a house, the government offers foreclosed single family homes. But make sure you work with a real estate agent, broker, or servicing representative to make an offer or bid. You can also find commercial real estate and land for sale. This surplus property includes office buildings, warehouses, commercial facilities, and former post offices. If you still haven't found something, you might consider buying seized properties from the IRS. Remember: Even though you can find considerable savings on government-owned property, everything sells at fair-market value. Live auctions - You can find many types of items like cars and trucks for sale at one location. Either before or on the day of the auction, you'll receive descriptions, instructions on how to bid, and the chance to inspect the merchandise. Sometimes you can find special items highlighted in print and online media. Online auctions - For surplus personal property, register on GSA Auctions. You can search for items by various categories and bid electronically. Keep in mind that once you place a successful bid on an item, you'll have to pay for it within two business days and pick it up within 10 business days. For other government property for sale, including real estate, start at GovSales.gov. Once you've found what you're looking for, follow the bidding instructions. Fixed-price sales - In this type of sale, all items have non-negotiable price tags. You can come in person to inspect, purchase, and take the non-returnable merchandise with you. The government hosts many types of surplus personal property and real estate sales--both in person and online--throughout the year. For sales online, there's no specific time frame, though sales typically last a week. There's a constantly cycling inventory, so you'll want to check the listings daily to find the best deals. You can make your money go farther on a wide variety of individual items. And that goes for bulk items, such as laptops, cell phones, and other electronic equipment, too. If you're in the market for a car, government vehicles are exceptionally well maintained and often come with detailed paperwork, as opposed to buying through a private dealer, who might not know the vehicle's maintenance history. You can also take heart in knowing that all proceeds from government sales go back to the original holding or selling agency, to the Land and Water Conservation Fund, or are deposited in the U.S. Treasury's general fund. And while there are no giveaways--yachts don't come cheap--the discounted prices give you another reason to try out a government sale. 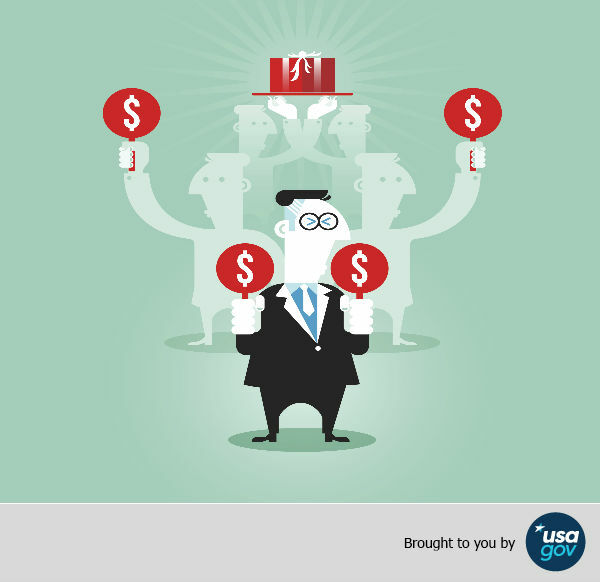 Learn more about buying from the government on USA.gov, your online guide to government information and services. Whether you're looking for surplus sales, collectibles, or other government-owned property available through purchase or auction, you'll find the information and services you need.